Today was (begrudgingly) my first day back in my classroom. I decided that since I've declared next week "Zen Time" and will be adamantly refusing to do stuff, I better do some stuff today. It went rather well, actually. I had Walmart bags of art supplies galore and some new posters from our trip to the deYoung that I wanted to drop off. I also knew if I went there I'd find a million other things to do. I was right! 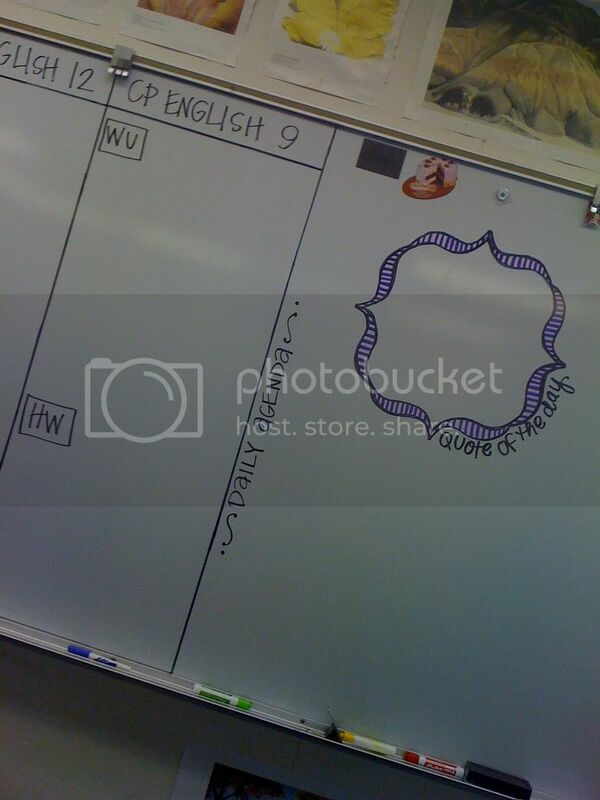 I thought that you might like a peek into my newly (as of the end of last year) reorganized classroom. After a year there, I made some changes to how I had it set up. This year marks the first one in NINE YEARS where I haven't had to move to a different classroom, so I was glad to put all that hindsight to some good use. I think all that moving was good for me though--I've realized over the years that I love a clean classroom (though you wouldn't know it to look at my home right now) and that if I keep things clutter-free and organized, I have a much better day at work. My room's a pretty good representation of me. There are some Englishy things, but a lot of dance posters (leftover from dance teacher days) and just art and things I like. It's a nice space to be in each day. My collection of old calendar pages from my Alonzo King Lines Ballet calendar. Love. I got some permanent marking done on the white board today. I'm as big a nerd for an organized white board as I am for charts, so I set up some permanent fixtures like these (above). You can also see some of my Georgia O'Keeffe prints above the board. It's actually a discount book of prints I got at Borders back when I was teaching dance. I hacked it apart with a razor and used the pages like posters--they border the front of my room. On the board are my agenda frames and my quote of the day box. For quotes, I love greatestquotes and iheartquotes on twitter, among others. I try to put up a new quote each day--something I started randomly last year but my students came to expect new ones all the time. I made the bracket frame using Microsoft word, then I printed it on an overhead transparency and projected it onto the white board so I could copy it. 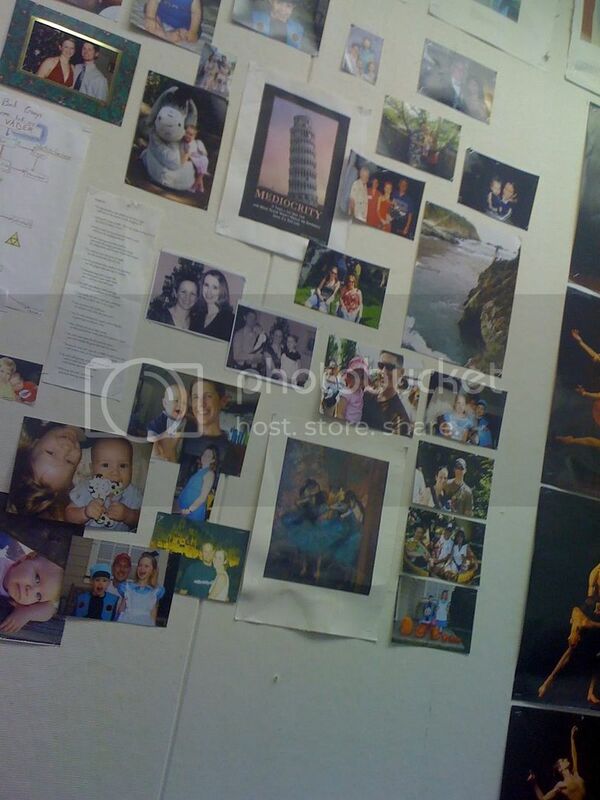 These are all my family pics behind my desk. 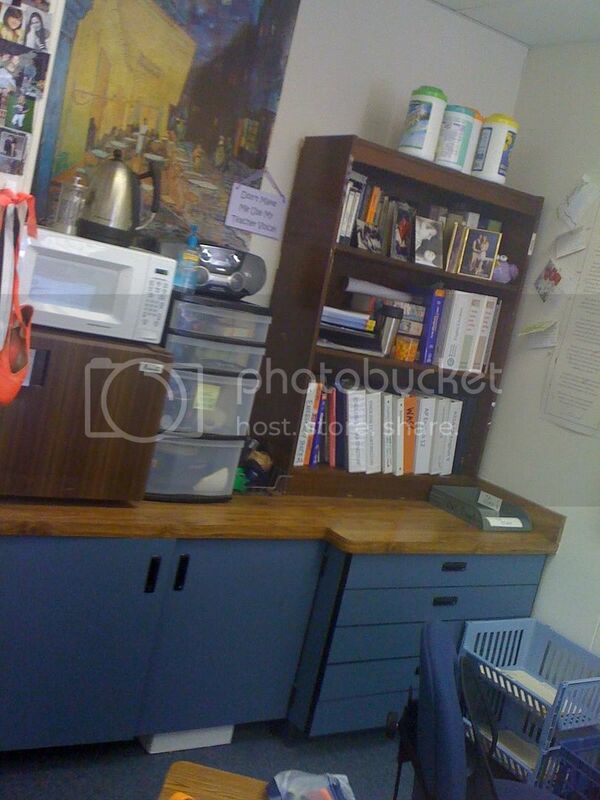 You can see my post about my desk area here (from last year, before I moved it to the opposite corner of the room). The couch, making its not-behind-my-desk-anymore debut. I am not 100% sold on it, as the thought my students wanting to pile on top of each other or sleep on it makes me ill... but I want to try it this year. I made a nice little "couch rules" list and posted it on the wall behind it. I mean, I'm a fan of the couch (especially for lunchtime relaxing and naps) and I do have my freshmen do silent reading once a week, so it could be cool, but I'm not sure they can be trusted. We shall see. My little sanctuary behind the desk. SERIOUSLY YOU GUYS, HOW CUTE IS MY BOY???? I found out yesterday I'm getting a student teacher this semester for my 9th grade classes. I'm spending lots of time wondering how that will go. It's been a while since I had a student teacher. I feel like I have lots of great ideas from the conference I attended this summer and a year of that same hindsight that's going to be put to good use as I prep to teach 9th grade again. As with all things, I'll just have to wait and see what that's going to be like--but I'm looking forward to it. It's 3:00 and we just finished eating lunch. I couldn't see pulling ourselves away from all that happy, productive work to do something like eat. It's catching up to me a bit, and I think I might go enjoy one of my last summer naps before I have to get dinner going (Taco Tuesday). Hope you are all well today. Dude, seriously love this post! 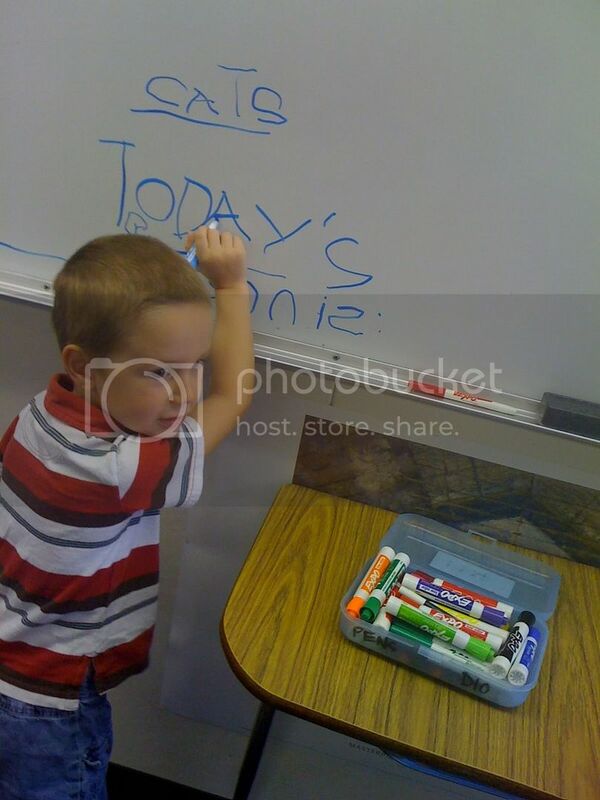 I did the same thing in my "classroom" with the help of Jordan today. I'm finally making the place mine and it WILL be clean! Yay! 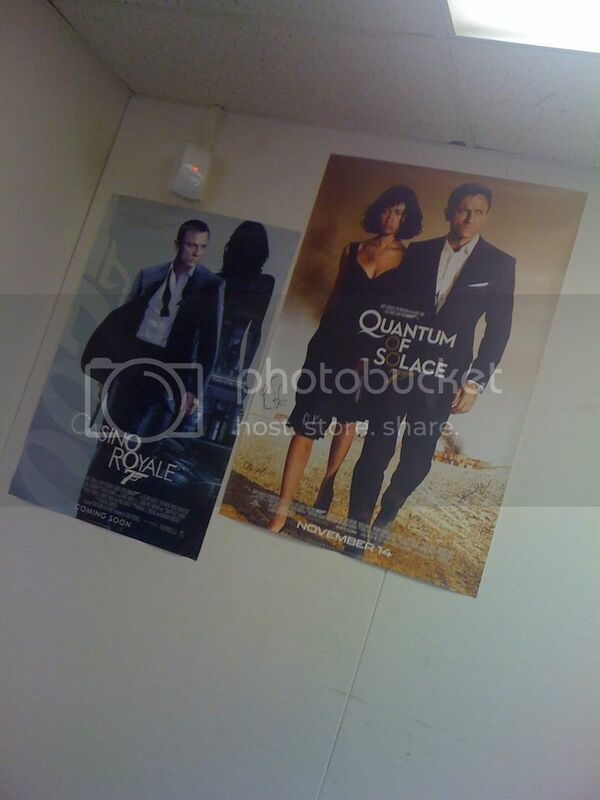 Things I lurve about your classroom: #1 DANIEL CRAIG! OMG he is so hawt! #2 Georgia O'Keefe #3 Hanko teaching about cats! PS It's Taco Tuesday at our house too! This is the nicest classroom I've ever seen! 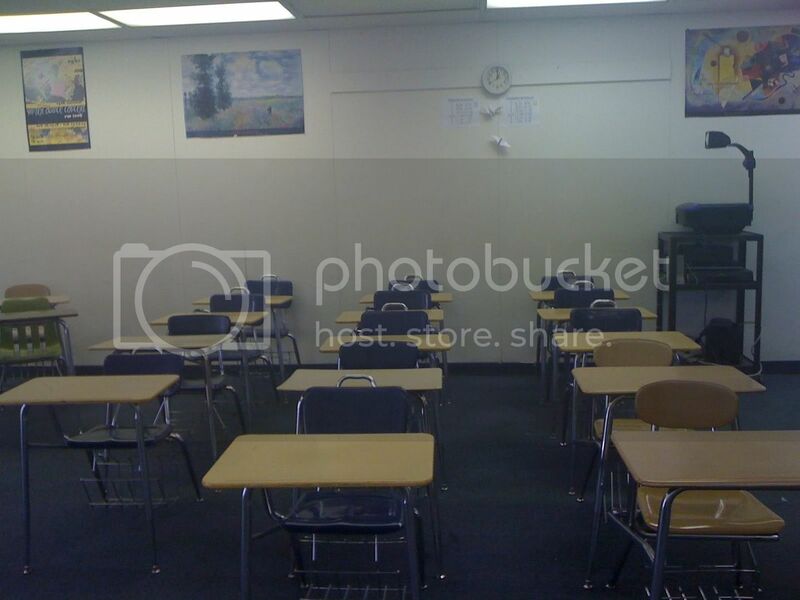 haha When I was in high school, all of my classrooms were dull and definitely no couches! Hope you have a great new school year! Your boy is very, very cute. The cutest. Although, I wish "today's lesson" was DOGS.